Three women are about to be executed. One's a brunette, one's a redhead and one's a blonde. The guard brings the brunette forward and the executioner asks if she has any last requests. She says no and the executioner shouts, ''Ready! Aim!'' Suddenly the brunette yells, ''EARTHQUAKE!!!'' Everyone is startled and throws themselves on the ground while she escapes. 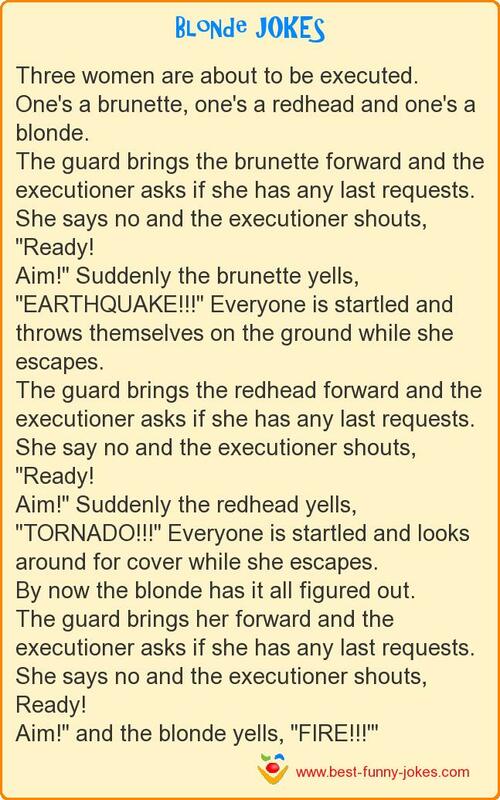 The guard brings the redhead forward and the executioner asks if she has any last requests. She say no and the executioner shouts, ''Ready! Aim!'' Suddenly the redhead yells, ''TORNADO!!!'' Everyone is startled and looks around for cover while she escapes. By now the blonde has it all figured out. The guard brings her forward and the executioner asks if she has any last requests. She says no and the executioner shouts, Ready!